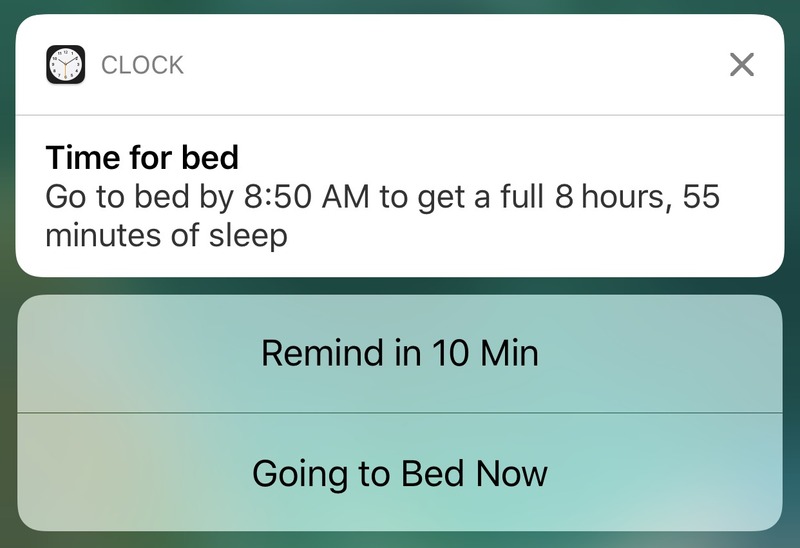 If you’re like me, and you’re bad at going to bed when you should, iOS 10 has a feature that could help. The Clock app now features a Bedtime timer to help you figure out when bedtime should be, remind you to go to bed, and track how much sleep you get. First, open the Clock app and go to the Bedtime screen. Tap Get Started and set a wake-up time. Next, select on which days you’d like to be woken up. Perhaps you like to sleep in on weekends, but if I don’t wake up at the same time every day, my sleep schedule gets all out of whack. Then select how many hours of sleep you’d like every night — the National Sleep Foundation recommends 7 to 9 hours. Your next step is to select when to be reminded to go to bed — 15 minutes before bedtime is the default. Then pick a wake-up sound — Early Riser is the default, and you can tap each sound to hear it. 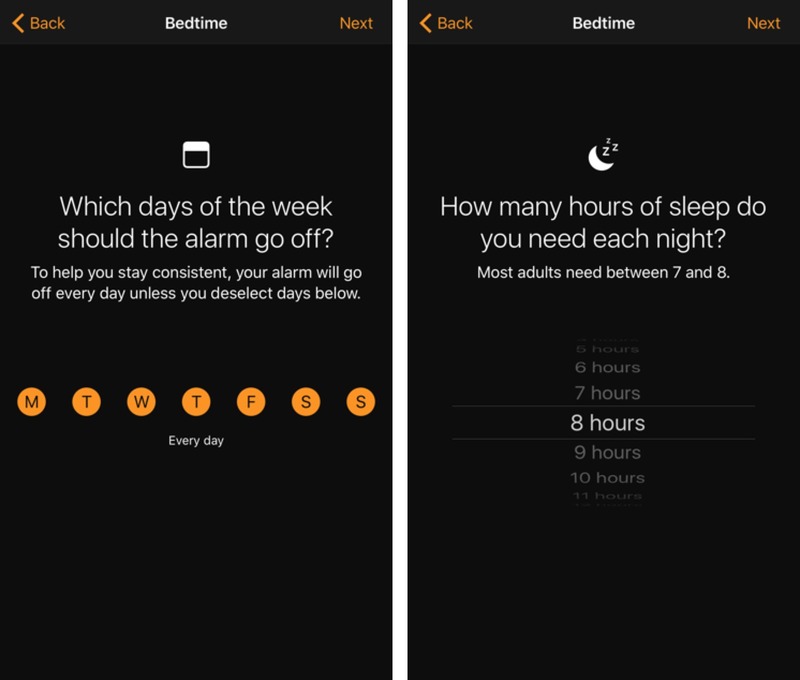 Finally, Clock will tell you about how it tracks your sleep and shares the sleep data with the Health app. 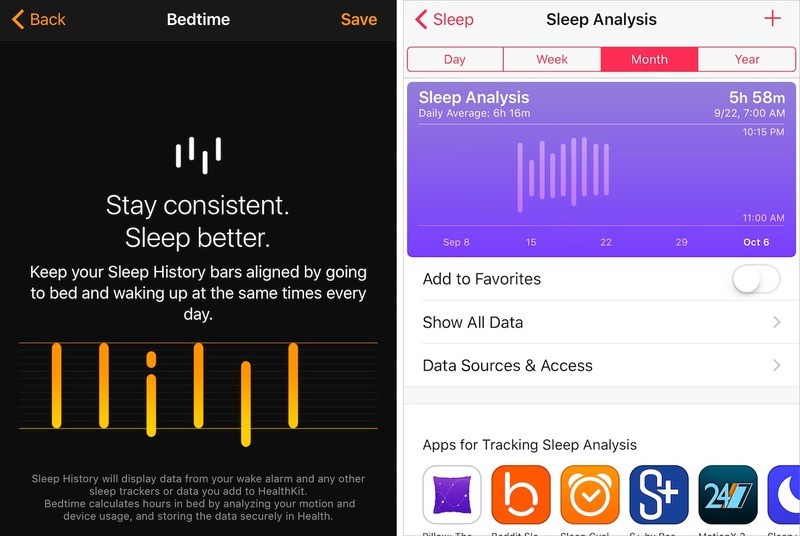 You can find your sleep data in Health > Health Data by tapping the large Sleep button at the top. I find the Health data display largely incomprehensible, but maybe you can make some sense of it. 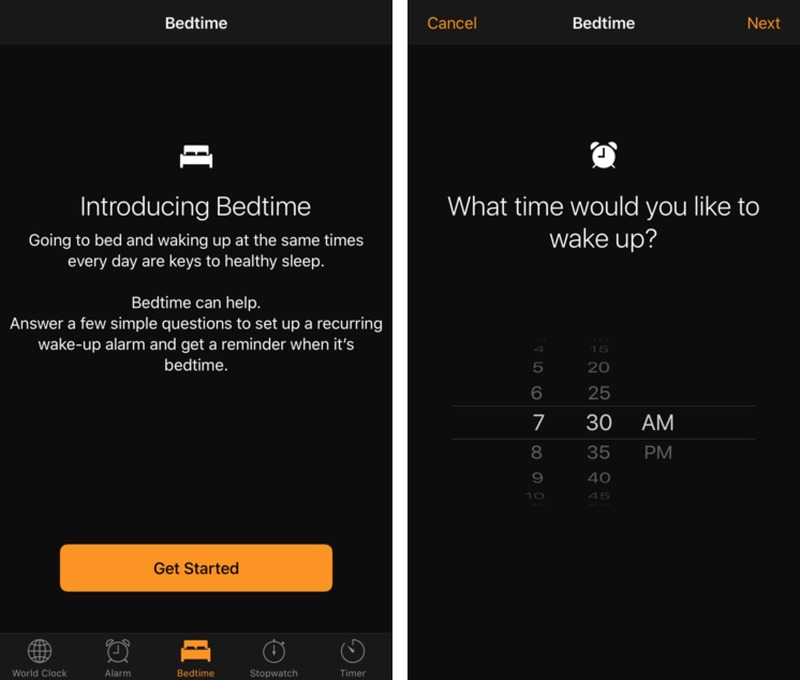 To adjust the Bedtime timer later, return to the Bedtime screen in the Clock app. A neat circular bar lets you change your sleep (moon icon) and wake (bell icon) times — drag an icon to adjust its time. 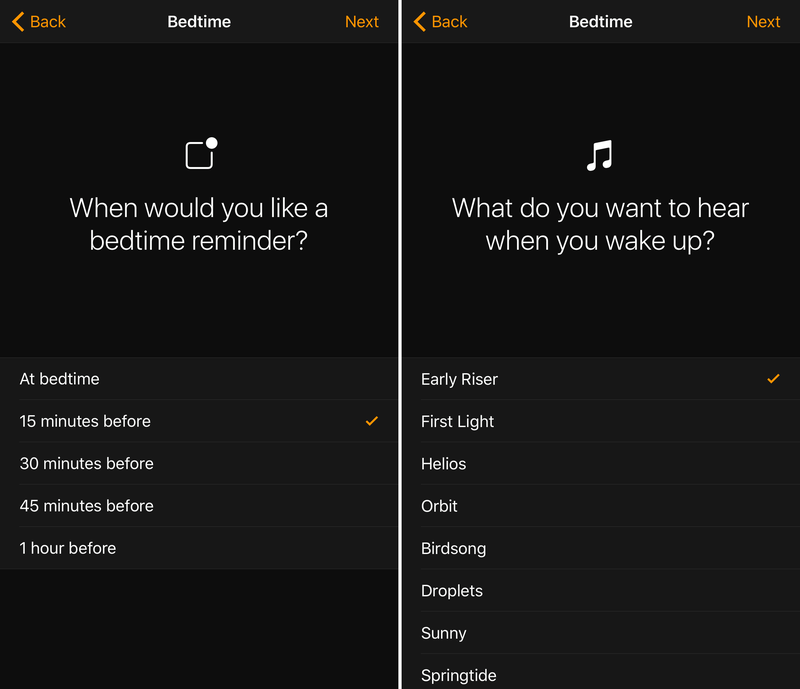 Tap Options in the upper left to change your alarm days, bedtime reminder, wake up sound, and alarm volume. When you’ve set everything, your iPhone will notify you with an alarm 15 minutes before it’s time to go to bed, or whatever you’ve set as your bedtime reminder time. Tap Going to Bed Now or Remind in 10 Min to dismiss the alarm. The Bedtime timer sets its own alarm for waking you up in the morning, so you don’t need to set one in the Alarm screen unless you need to make sure you’re up at a particular time. Hopefully, the Bedtime timer will help you manage your sleep better. I’d like to say that it has done so for me, but all too often, my best intentions are trampled by book deadlines or the call of my PlayStation 4. I don't pay any attention to those statistics (and I ignore my phone when it tells me it's bedtime) but I use this feature simply because the lovely sound of the gradually loudening 'Early Riser' wake up song is a great way to regain consciousness. I previously used a daily weekday alarm in the Due reminder app but Apple's option is really just so nice. What I want to do is *remove* that Bedtime option from the clock. I don't need it, and its presence is annoying. I've been trying to use this function for some time, but it usually doesn't work properly. It almost never reminds me to go to bed. It does usually wake me up in the morning. I'm assuming this is a bug Apple will fix soon.. Anybody else having issues? I just had the new update which was supposed to address the issue of if not waking you in the morning/ alarm. Unless I am just that much of a complete zombie in the morning- this is the second time this bug has made me late for work, even after the update. You are not alone my friend. I found this app very cool, but it is not sold in Switzerland, which is not cool at all. 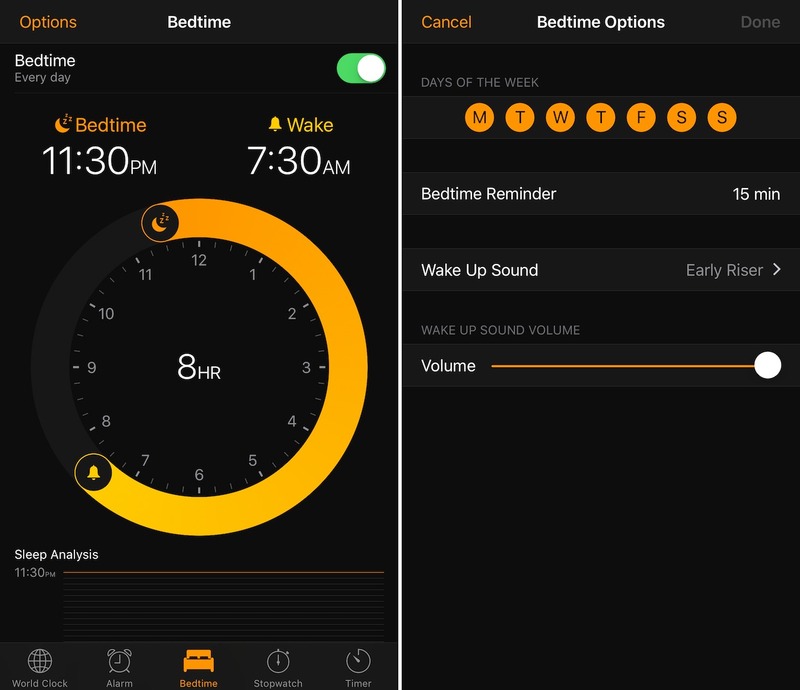 The Bedtime timer is built into the Clock app, which is bundled with iOS 10. Are you saying that some aspect of that chain (iOS 10, the Clock app, or a feature of the Clock app) is not available in Switzerland? I've been trying to understand how the data in the health app about sleep is collected. For example, The bedtime alert goes off at 1:00am,I actually go to sleep at 1:25am. And then the health app shows that I had four sleep events. 1:25am-3:39am, 3:41am-6:22am, 6:27am-7:25am and 7:25am-10:14am. If you drill down the individual events all say they were logged by the "Clock" app. I wasn't keeping track on my own, but I wouldn't be surprised if the breaks were for at least one bathroom break. But I can't figure out how it knows! I keep the phone on the desk next to my bed. Does it monitor the accelerometer and figure that if the phone is raised that I'm not sleeping? I likely checked the time or something. I keep an apple watch in nightstand mode next to the phone at night, and if I wake up in the middle of the night sometime I thump the nightstand which lights up the watch. Is this detectable by the clock/health app? Apple believes iPad owners have no need to track health data so the Health app is not available on the iPad.